Welcome to Mackadoo's! 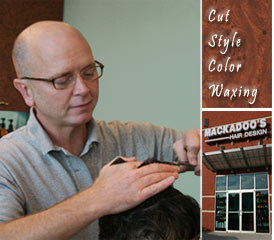 We are commited to providing our clients a value added service that is "simply the best" in hair design. We promise: extraordinary products, in-depth knowledge and education, a passion for our art, an ongoing pursuit of excellence, and an environment that is casual yet classic. So whichever technician you visit you will receive a level of service that is unparalleled.